PuzzleGraph is a tool for creating simple typical computer game puzzles and then analyzing and visualizing their state space. 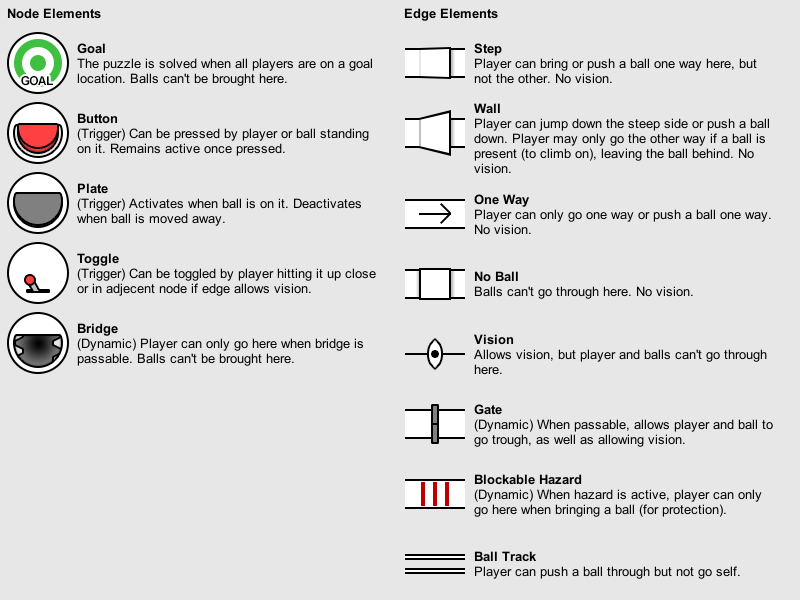 Setup and connect puzzle elements like gates, toggles, pressure plates and boulders. See the state space of the puzzle visualized, including solution paths, dead ends and fail states. 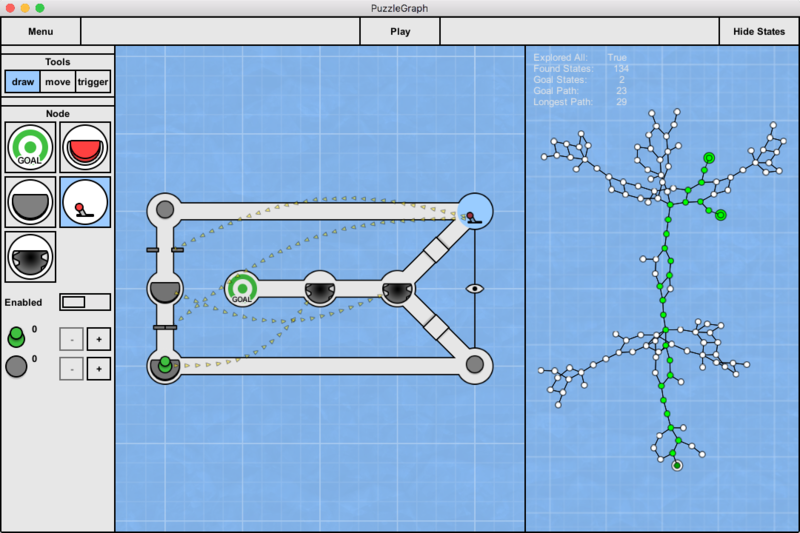 If you use PuzzleGraph - either purposefully or just messing around - please tell me about your experience. And I'd love to see puzzles you make with it, and potentially include them with the distribution if you want! 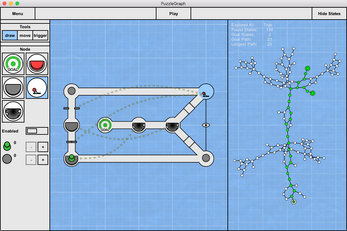 PuzzleGraph is open source and the source code is available here under the Mozilla Public License, v. 2.0. All the node and edge types now have tooltips to make it more clear what exactly they do and there is a help screen with an overview of all the element types. 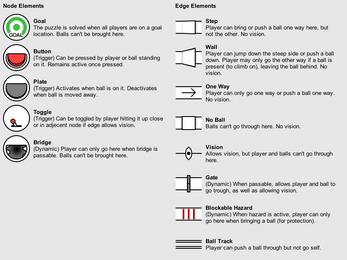 I also added three new puzzle elements; the one way edge, the blockable hazard edge, and the ball track edge. Great tool. I'm looking for ideas to make games and this has my mind racing! Just thought I'd drop that here in case you are after (visual) bug reports. Hey, awesome to see you read these comments! I've been enjoying spending a lot of time just reading/rewriting/mucking around with the code and seeing ways this project could be taken further. In this case, it seems to be due to the merging of states. As you know, states nodes are created, and then compared to existing states, to see if it's actually an already existing one. In the case of 2 players (other than when they can't reach each other), every state (other than when they are in the same node), involve an exact replica, in which the two players are switched. This visual bug is caused due to the state in which the players are where you'd expect, having been replaced with the state in which they are switched. The ideal solution in my mind is not so tightly linking specific 'movables' to each state, but instead merely linking the concept (or definition) of that movable to the state, and then evaluating which particular movable is most appropriate to animate to the new location. I really like the way this gives immediate feedback to the designer. It might not be the best way to actually design a well-crafted puzzle, but you can just adjust the variables around bit by bit and instantly know if you've destroyed the intended path through the puzzle or opened up a bunch of unintended ones. I've never been able to find the video of the talk since I watched it originally, but I remember Marc Ten Bosch (Meigakure dev) talking a bit about state spaces and how he tries to design puzzles that create large state spaces with a short goal path, the notion being that these puzzles are easy to solve, but only if you know the solution. This kind of visualization would be pretty useful if that's your design philosophy, especially if it was integrated right into your dev tools (assuming your game lends itself well to being analyzed as a state space - grid based movement and all that). But I got a new pc and it works on this one? Weird. I am currently messing around with it and there is a problem with one way passages, they don't work. I can still come back. Also Door that starts open doesn't seem to let me go through either. Great work / superb value. Rugged quality work for solid puzzle game construction in any dimension including virtual to physical. Great application potential for demands of emerging platforms. This is soooo awesome! I teach gamedev in high school and I will definitely use this. Thanks to share your awesomeness!